Kevin Eldon and Simon Munnery are well-known to British comedy fans. 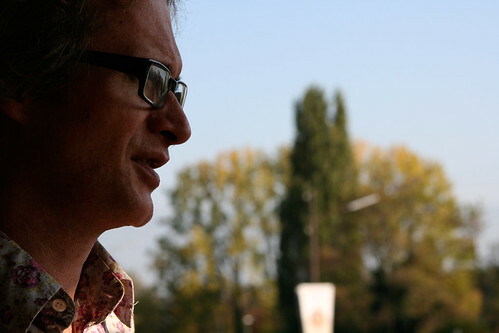 Also known by his stagenames of Alan Parker: Urban Warrior and The League Against Tedium, Simon Munnery is a comedy writer and experimental standup comedian.The Observer newspaper called Simon, ‘One of the most original and talented comedians in the country’. He’s recently released two DVDs of his work and one of his songs, Grey Clouds – a take-off of The Orb’s Little Fluffy Clouds– was featured on Annie Nightengale’s CD Y4K. 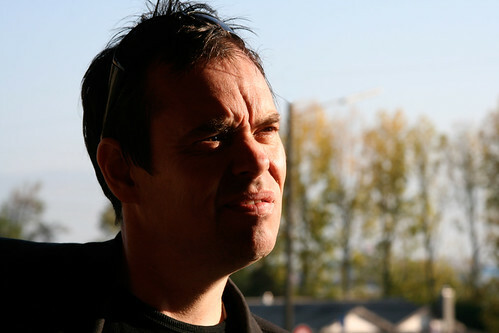 Kevin Eldon will be recognised from comedy projects such as Brass Eye, Black Books, I’m Alan Partridge, Spaced, Big Train, Fist of Fun and Hyperdrive, and appeared as Sergeant Tony Fisher in Hot Fuzz alongside Simon Pegg and Nick Frost. He also appeared in Simon’s surreal comedy series Attention Scum. Have a look. Brian Cox invited them out to Geneva for a tour of CERN and they proved to be extremely informed and interested in physics and the work being done at CERN. And, it goes without saying, they were very funny, too. 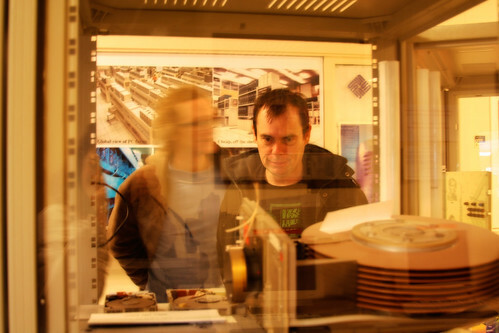 Kevin and Simon are taken on a tour of CERN’s computer centre – the Vatican of The World Wide Web- as well as the tunnel of the Large Hadron Collider. Brian talks to CERN Theoretical Physicsist, Professor John Ellis, about Supersymmetry, Super Strings, Dark Matter and Dark Energy and a Super picture of Peter Higgs in a bathing suit. Brian talks to Lyn Evans, the LHC Project Leader. Architect Charles Jencks, author of ‘The Garden of Cosmic Speculation’ visited CERN recently. His landscape work is inspired by fractals, genetics, chaos theory, waves and solitons. These themes are expanded in his own private garden, the Garden of Cosmic Speculation, near Dumfries, Scotland. For more on Charles Jencks, please visit his website. John Barrowman was invited to visit CERN on 2nd April, to take part in a podcast. He was accompanied by Scott, his in laws Sterling and Shelagh Gill and his manager Gavin Barker, and they were the guests of Dr Brian Cox. These mini-Big Bangs are surrounded by giant detectors, two of which are ATLAS and ALICE (the other two are called CMS and LHC-B). ATLAS is a general purpose detector – essentially a 7000 tonne, 20m high and 40m long digital camera, that takes pictures of the mini Big Bangs and looks for new particles and phenomena that would have been around in the Universe in those very early times. ALICE is tuned to do something slightly different – it uses a detector which includes the wonderfully named Time Projection Chamber to look for a quark-gluon plasma, the strange state of matter that we believe filled the Universe in these very early times. The Quark-Gluon plasma is a kind of soup, out of which the normal matter that makes up our bodies, and all the stars and planets we see today, are made. For more on John Barrowman, please visit his official website. Don’t miss the video of John at CERN.